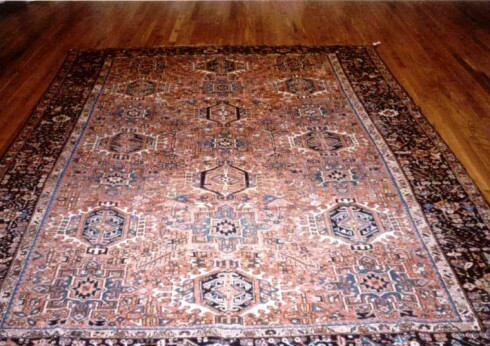 THE KARAJEH RUG - The power of the pattern known as the triple medallion motif. Karajeh is a small rural village located in the Azerbaijani region of northwestern Iran. In this mountainous and isolated countryside near the slopes of Mount Abalan, the quiet and natural beauty of the place can feel suspended in another time. Many of the Turkish-speaking tribes who call the area home remain semi-nomadic, practicing today the same long-held traditions that carried them on their migration from central Asia centuries ago. 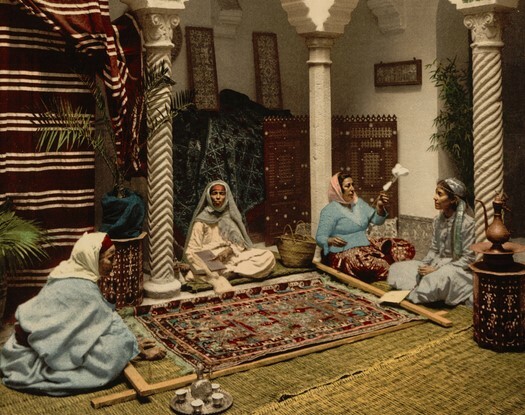 Among these, at the core of Karajeh art and culture, are the superlative carpets woven by the Karajeh women. These rugs, distinguished among Persian carpets of their time, have been described variously as "whimsical," “rustic,” even "fun," doubtlessly for the spontaneous and vivacious quality of their patterns. 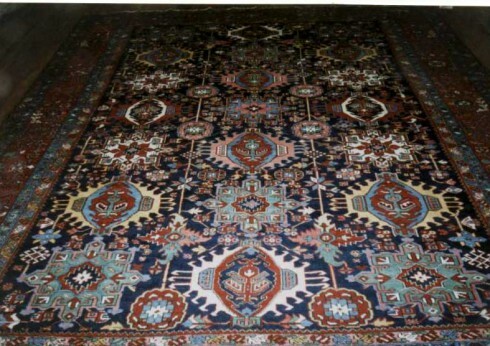 Among the broader category of Heriz Persian rugs, of which the Karajeh carpets are a unique part, they stand out beautifully for their expressive character, as though the rugs themselves are the living embodiment of tribal tradition. At the heart of the distinctive Karajeh design is a pattern known as the triple medallion motif. Here, a triptych of framed medallions form a single vertical column, or less commonly, multiple horizontal columns centered in the field of the rug. Among all Persian carpets, only the Turkoman rugs of northeastern Iran can be found with similar design. Significantly, in the Karajeh rugs, each medallion features a unique motif. Nor is it only the triple medallion that lends these rugs their energy. Surrounding the medallions, amalgams of sometimes imagined patterns fill the field and borders. Drawing not only on 19th century Heriz patterns, but also on older Karajeh tribal patterns to fill the field, the weavers create wonderfully improvised designs; circles, stars, and branching flowers coalesce, creating an arts-and-crafts quality that contrasts beautifully with the restrained elegance of Karajeh design. Their distinctive patterns aside, Karajeh carpets are not total outliers when it comes to their categorization among the Heriz. Comparing their materials and construction with the high quality dyes and weaving traditions of other mountain villages, the regional similarities are clear. Like their Heriz cousins (many also woven in provincial areas outside of the city of Heriz itself) Karajeh rugs are known for their hard-wearing durability. They descend from utilitarian weaving traditions of nomadic tribes, whose textiles were made to withstand harsh conditions and constant travel. The foundations are made of thick cotton warps and either cotton or wool wefts. The pile is typically wool, medium-high, thick, and knots are tightly packed. And the color scheme of the Karajeh rugs, too, is typical of the broader Heriz region. Colors are possibly influenced by the art of the Caucasus, just across the border to the north, where earth-tone dyes dominate the traditional palette. As in those northern mountains, the palette of Karajeh rugs (and of Heriz rugs in general) is earthen and warm, dominated by the red, cream, and green dyes that mellow beautifully with age. 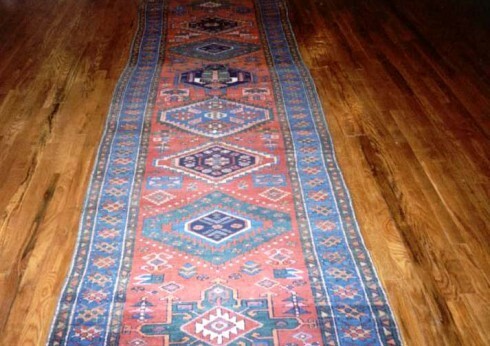 Karajeh rugs are typically found as mid-sized room carpets or runners, and are, perhaps unsurprisingly, in high demand among collectors.